RADECS 2018 EXHIBIT REGISTRATION IS CLOSED! RADECS, September 16-21, 2018, in Gothenburg is a full 4 ½ day conference. RADECS will offer Technical and Poster Sessions and an Industrial Exhibit. We anticipate a strong attendance. It is the most prestigious conference on Radiation Effects held in Europe! RADECS has sold all the 40 exhibits and we have added 12 more in Hall H where 100 RADECS posters will be displayed. Please join Atron, ESA, IMEC, URSC-ISDE in Hall H. The booth costs and package benefits are the same! 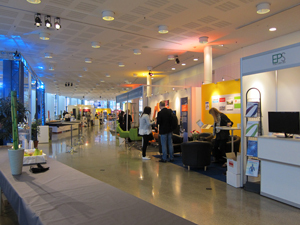 RADECS sessions and exhibits are convenient to your Gothia Towers hotel room. Attendees will walk through the 40 exhibits to reach the Technical Sessions. RADECS will host the daily breaks as well as an Exhibit Reception Tuesday evening in the Exhibit area. The Poster Sessions and Conference lunches are located next to the exhibit area. The RADECS Exhibitor Reception will be held Tuesday, September 18. Exhibits will run through Thursday, September 20 with tear down being in the afternoon. NOTE: Companion/Guest registrations for the social events can be purchased separately. Please be aware of the Exhibit Rules and Cancellation deadline. If you have any questions please contact Cristina or Christian! Cancellation Deadline: Cancellation after May 2, 2018, is non-refundable. If cancellation is made before May 2, 2018, you will receive a credit to your paid registration less the Cancellation Fee of SEK 1000 excl. VAT.